In the artesian well of La Rioja, Spain the water begins its journey in the essence of a land known all around the world for the exquisite taste of its wine. Layers formed millions of years ago from minerals, loam, sandstone, clay and rocks that act as natural filters. In the artesian well, water under pressure accumulates between the underground layers and then flows naturally at a constant temperature of 22 degrees. 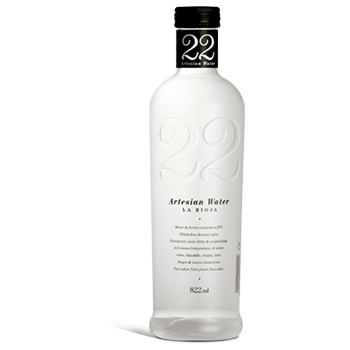 You can find the perfect water for a good meal in 22, where everything is carefully taken care of: from the wine pairings to the menu, from the starters to desserts, using the best raw ingredients for that perfect harmony between food and water with marked tones of calcium and fluoride: unforgettable. Water with tastes that sets the bar high, that doesn’t mask the flavours of the food that you are eating and, at the same time, is intensely refreshing and mild without making you feel full.